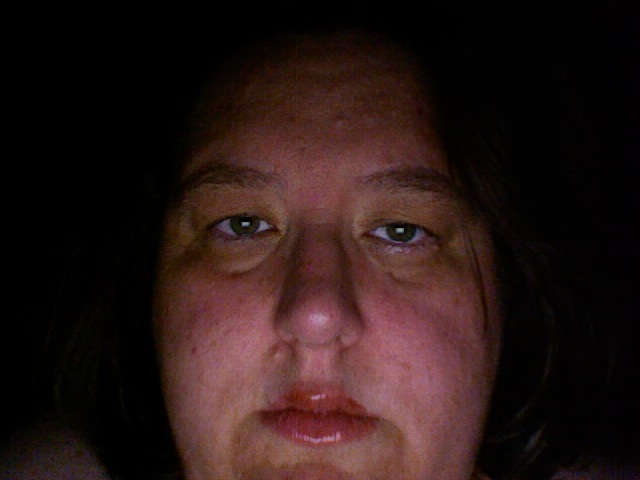 I look both a bit jaundiced and a bit Blair Witch, apparently. And I have no shirt on, though you can't see that in the picture. I took it with the built-in camera in my MacBook, using Photobooth. Oh, man, I totally put my shirt and bra back on to take that picture. I think we might have the same color eyes. Or yours are doing a good imitation of mine. I suppose we could, but why, really? I was sleepy. The Ambien was kicking in, and I shoulda beenin bed.